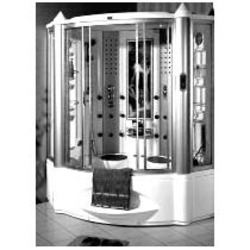 We are offering high quality Steam Shower Room to our esteemed clients. The Steam Shower Room has blue, white partitions that ensure an attractive visual pleasure. We use premium quality toughened glass as per 3C certification for manufacturing Steam Shower Room, which enhance its durability, look, and finishing. Besides, we provide it at the most affordable prices to our clients. Soal Enterprise is one of the leading Suppliers and Importers of Bath Room Fittings and Accessories. Our impeccable range of Bath Room Fittings and Accessories comprised of Bathroom Vanity Set, Bathtub, Brass Ball Valves, Sliding Shower Panel, Steam Shower Room, and Metal Polish. Our product range is lauded for its premium quality, dimensional accuracy, high strength, and corrosion resistance. We strictly procure the Bath Room Fittings and Accessories from the reliable vendors in the international market. The fittings are available in various sizes, shapes, designs, and patterns. They can be easily installed as per their requirements. Ours is a Mumbai (Maharashtra) based company with a vast experience of 14 years in this domain. The company was founded in the year 1998 and since then working sincerely under the guidance of Mr. Chirag Shah and Mr. Mehul Shah, the Partners of the company. The company came into existence with an objective of providing effective solutions to its clients. To meet this, we have assigned a team of experts in each department. Further, we strictly implement the business practices by rendering optimum quality Bath Room Fittings and Accessories at reasonable prices to our clients. We also make sure to meet the deadline. We are backed with well developed and modern warehousing facility, which is divided into various segments. This technique facilitates easy retrieval of goods at the time of emergency. With the well divided segments we store our products in an organized manner. Further, our warehouse features hygienic and safe storage environment for storing wide variety of products. We with the hard work of our team members and sincere dedication toward achieving goal of the company have established our foothold in the both national and international market. As per now, some of major countries where we deal are China and Italy.